1. Whisk together oats, chia seeds and salt in a medium sized bowl. 2. Add yogurt, milk and vanilla. Whisk until combined. 1. Add the honey and mix. 2. Add the banana, almond butter and chocolate chips. Stir together until just combined. 3. Transfer to a half pint glass jar and close with lid. 4. Refrigerate for at least 2 hours, but up to 5 days. 2. Add the raspberries and almond. Stir together until just combined. 1. Add the maple syrup and mix. 2. Add the brown sugar, cinnamon and pecans. Stir together until just combined. Whisk together oats, chia seeds and salt in a medium sized bowl. Add yogurt, milk and vanilla. Whisk until combined. Add the banana, almond butter and chocolate chips. Stir together until just combined. Transfer to a half pint glass jar and close with lid. Refrigerate for at least 2 hours, but up to 5 days. Add the raspberries and almond. Stir together until just combined. Add the maple syrup and mix. Add the brown sugar, cinnamon and pecans. Stir together until just combined. These are just our favorite recipes. Experiment with your own! 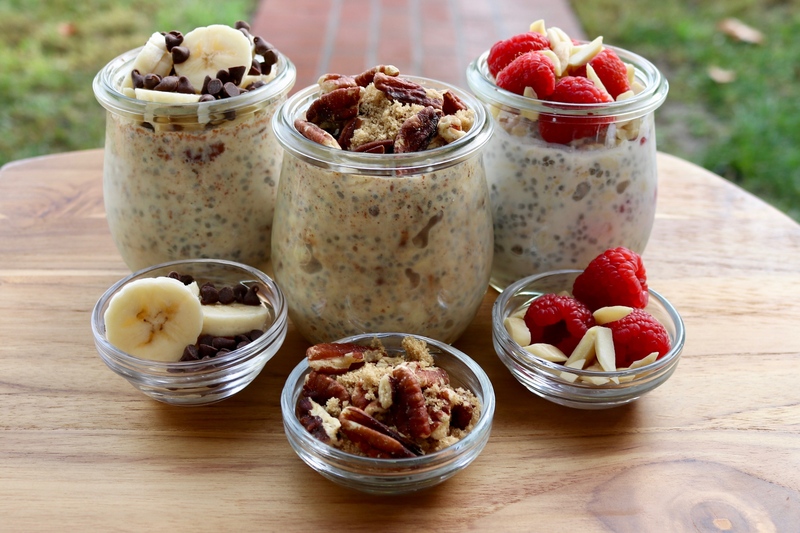 Overnight Oats are versatile and are delicious in many different flavor combinations.